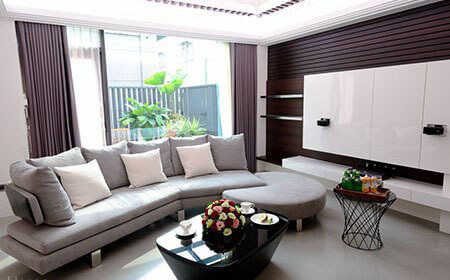 EACH OF HORIZON'S FOUR FACILITIES IS INDEPENDENTLY ISO 9001 CERTIFIED AND UTILIZES THE MOST ADVANCED BUILDING AND DESIGN TECHNOLOGIES TO ASSURE THE HIGHEST QUALITY THROUGHOUT EACH BUILD. The Horizon Group has remained on the cutting edge of yacht design and construction for almost 30 years. While it has expanded to become one of the most respected yacht brands in the world, Horizon has continuously improved upon every aspect of the boat building process - a feat we would be unable to accomplish without our own dedicated shipyards. Horizon's facilities include the Horizon, Premier, and Vision yards, each of which build yachts in fiberglass within specific size ranges, as well as Atech Composites, our dedicated composites and lamination facility that utilizes the VARTM process to provide decks and superstructures for all three shipyards. Horizon Yachts builds to the standards of the world's leading classification societies, including Det Norske Veritas (DNV), Bureau Veritas (BV), Lloyd's Registry (LR) and American Bureau of Shipping (ABS). Horizon also builds to Flag Code compliance with MCA LY3, USL (Australia), NK (Japan) and CNS (China), and adopts SOLAS, MARPOL, CORLEG and MLC construction standards. To date, Horizon has delivered over 820 luxury yachts, and no two are exactly alike; each yacht is a reflection of her owner's lifestyle, created with the dedication only achievable by a team of experts who are committed to customer satisfaction and long term industry success. 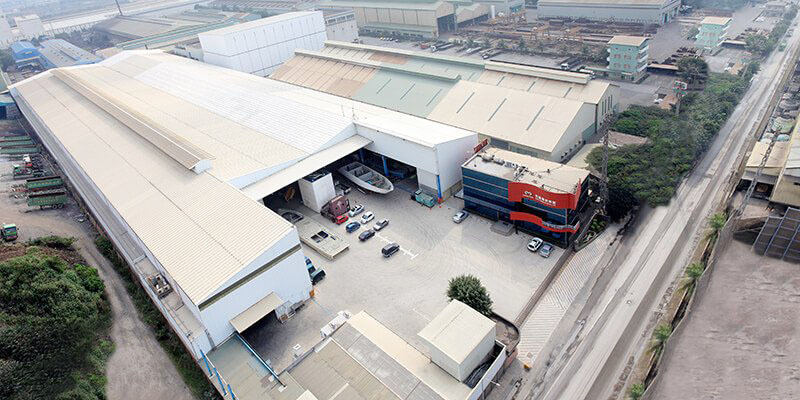 The Horizon Yacht shipyard is the original yard established by John Lu in 1987 and the main headquarters for the company. Through the years, the yard has grown to encompass 452, 080 square feet and 320 employees, concentrating on building select sizes from 60 to 110 feet and each in their own bay, so the yacht's build progress is not dependent upon a production line. 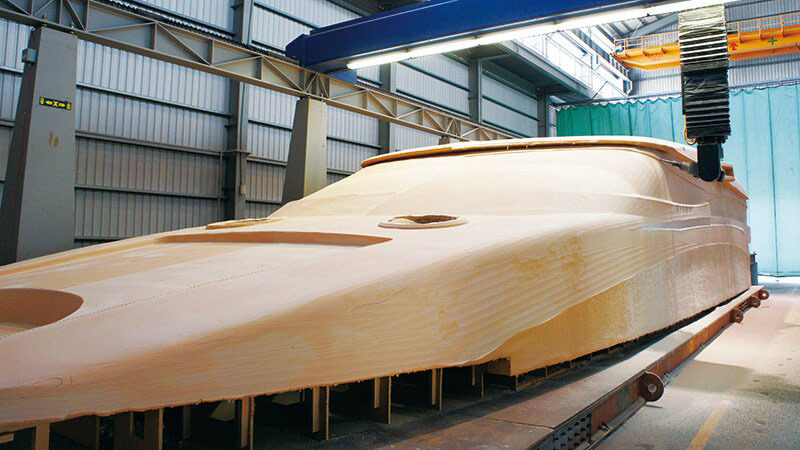 The Horizon yard incorporates fundamental yacht manufacturing equipment and systems, including important testing equipment, such as two 100-foot test tanks and a water shed, as well as our 5 axis router and CNC milling department, which ensure the best and most accurate molds possible. The 5-axis router run on 90-foot tracks and works at a speed of 1,800 inches per minute; the router is able to stop at any precise position within a 0.01 tolerance, creating forms that are almost perfectly symmetrical and remarkably consistent. As the corporate headquarters, the Horizon yard is also home to numerous integral departments such as the mechanical engineering development center, where 30 naval architects with master's degrees are employed along with 65 full-time engineers; the interior design center with a dedicated interior design team; business administration and human resources centers; global marketing center; IT and systems departments; and the offices of CEO John Lu. Founded in 2000, Atech Composites employs 250 team members -- including a dedicated R&D composites team -- within its 249,070 square-foot lamination facility and is responsible for providing all composite hulls, decks, and superstructures to the three Horizon shipyards. Horizon's own patented VARTM (vacuum assisted resin transfer molding) process allows Atech to laminate each hull in a single shot, including the stringer system, which gives the finished product more strength and durability without compromising weight or performance. Certified for meeting ISO 9001:2008 standards through DNV, Atech ensures that every DNV procedure conducted satisfies the requirements for hull quality. The professional lamination team utilizes the most advanced machinery in the construction of Horizon's hulls, including a 10-ton material testing machine that verifies the mechanical properties of all the composite materials supplied, as well as conducts comprehensive testing of composite materials and new products at the in-house laboratory. Atech constantly pursues the latest technological advances in the field of composites and more recently has applied the company's composites expertise to outside fields such as the aerospace industry; high speed trains; and manufacturing and repairing wind blade turbines with a GL certification. Vision Yachts was established in 2001 to build select sizes ranging from 52 to 80 feet within its 161,460 square foot facility and has expanded through the years to 250 employees; Vision is also certified for ISO9001 2000 standards through DNV. The shipyard can accommodate 15 yachts under construction simultaneously and in their own bay, as with the Horizon yard, and also incorporates testing areas, such as the test tank, as well as their own Interior Design center. Vision strives toward innovation within Horizon's smaller yacht models, focusing on interior and exterior designs that appeal to a wide variety of yachting lifestyles. 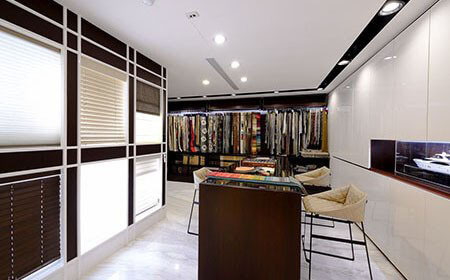 Founded in 2005, Premier Yacht was originally dedicated to the construction of custom megayachts of 100 feet (30M) and above, but a new business strategy in 2013 changed the focus of the facility from new construction to refit and repair. The Premier shipyard now focuses on yacht maintenance and repair and refit of 100-foot plus (30M ) yachts. Premier's 258,330sqft facility can simultaneously accommodate six yachts of 120 feet (40M) and above under cover. The yard also owns 656 feet (200M) of waterfront property as well as an automatic float on/off launch barge with a 650-ton lifting capacity for yachts which L.O.A less than 200 feet (60M), beam 45 feet (13.4M), gives Premier a logistical advantage for sea trials, commissioning, and loading completed yachts to be delivered on board container/bulk ships. 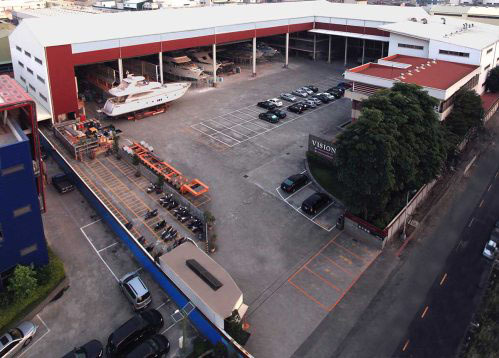 Thanks to its ideal geographical location on Kaohsiung Harbor, the Premier shipyard has also been designated as the delivery center for Horizon yachts. 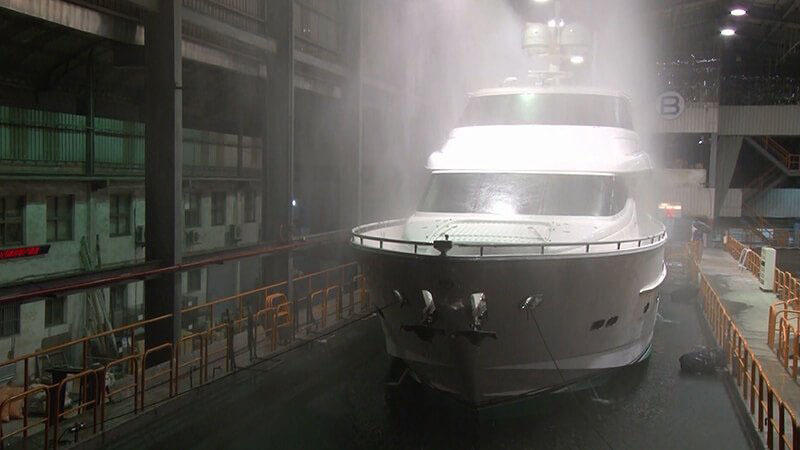 With 180 employees that include experienced naval architects, marine engineers and a technical team, the Premier shipyard is certified with OHSAS 18001 - the Occupation Health and Safety Assessment Series for health and safety management systems - that ensures safer working environments for employees; Horizon Group was the first yacht builder to be endorsed with this certification in Asia. Located in North Palm Beach, Florida, Horizon Yacht USA is the U.S. sales and service headquarters for Horizon Yachts. Concentrating on new yacht build projects and inventory yachts, Horizon Yacht USA works closely with our clients throughout the entire yacht purchasing process; from the initial introduction stages through to after sales service and support, Horizon Yacht USA is there every step of the way to ensure we not only satisfy but also exceed our client's expectations. Our team is comprised of individuals who each possess a passion for boating and Horizon Yachts, integral industry experience and offer combined expertise in a vast array of yachting sectors including: new builds; interior layout and design; current market trends; trade-ins and brokerage sales; yacht care and maintenance; after sales service; and more. Horizon Yacht USA's goal is to provide our valued clients with a well-rounded and enjoyable yacht experience from beginning to end. 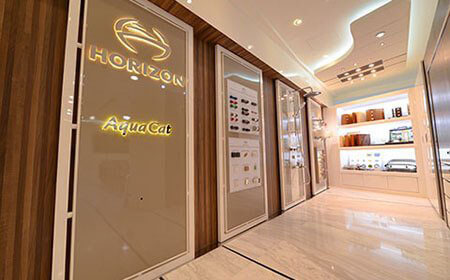 HORIZON'S INTERIOR DESIGN CENTER OFFERS CLIENTS THE COMPLETE INTERIOR DESIGN EXPERIENCE WITH THEIR NEW HORIZON YACHT. Working together with Horizon's in-house design team, owners can bring their creative visions to life with the new Horizon Interior Design Center. 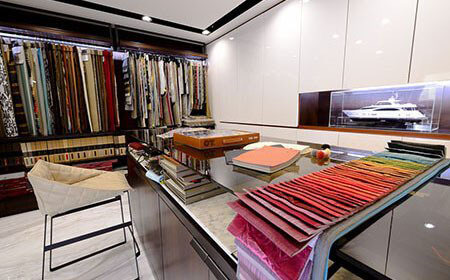 The center reflects the same luxury found on every Horizon yacht and houses a spectrum of décor samples, from granites and woods to fabrics and blinds, to make the design process as easy as possible. 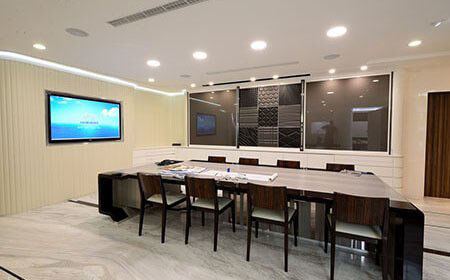 Interior layouts and 3-D renderings are available for viewing within two conference rooms, and each conference room's computer is able to connect with and display Horizon's extensive build database, which offers full photos and details for yachts built onwards of 2002. The Horizon Interior Design Center aids Horizon in delivering a more well-rounded build experience and ensures owners have all the resources needed to make their dream yacht a reality. 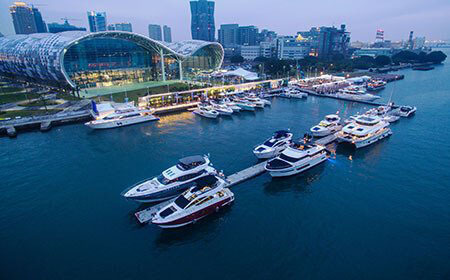 The Horizon Group recently developed a world class luxury yacht marina that offers a full range of marine and yachting lifestyle services in Taiwan. 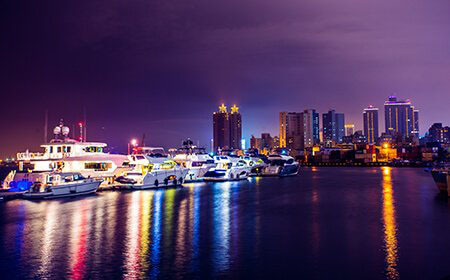 Located in the heart of downtown Kaohsiung, Horizon City Marina can accommodate 40 yachts ranging in size from 40ft (12M) to 130ft (40M). The floating dock design features hidden sea anchors that stabilize the dock without the need for dock pilings; easy-to-access slips with convenient finger piers; and multifunction dock pedastals with various power supplies and fresh water connections. 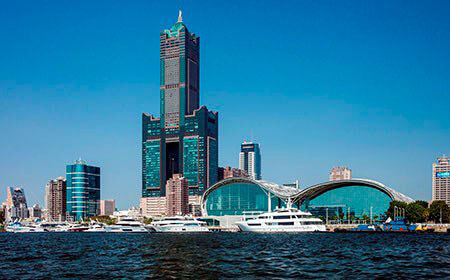 Horizon City Marina is convenient to Kaohsiung's main transportation lines, including a new waterfront light rail transit system, as well as surrounding hotels, restaurants, and shopping centers. 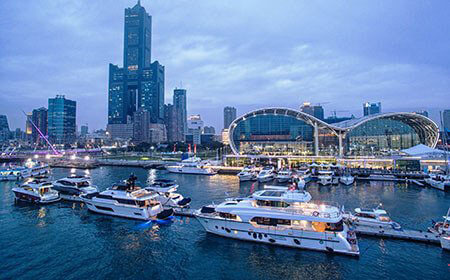 For clients who wish to explore Taiwan's coast line, Horizon's Yacht Management and Concierge Service will provide mapping and provisioning for cruising trips as well as help secure dockage.